Yoshi’s up all night to get crafty! It’s taken two years, but it’s time to celebrate, for everyone’s favourite green anthropomorphic dinosaur, finally has a game to call his own on the Nintendo Switch. First revealed during E3 in 2017, the release of this side-scrolling platformer has been a long time coming and now thanks to Nintendo, I get to tell you if it’s worth picking up or not! 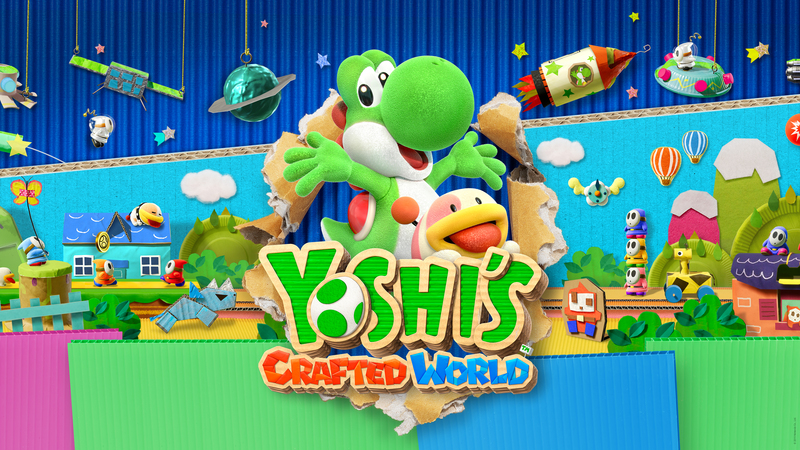 Much like previous Yoshi titles, Yoshi’s Crafted World is a platformer with an interesting design choice, thanks to each stage in the game being comprised of handcrafted cardboard cut-out locales and objects, whereas the likes of Yoshi and enemies maintain a 3D presence. Where the aesthetic gets really fun however, is twofold. Firstly, the way the 3D characters interact with the 2.5D planes works really well, especially when grabbing an egg and firing it at things like houses, coins and even Smiley Flowers that are lurking in the background, foreground and middle ground. As for the second fun aspect, its got to be the Flip side. Throughout the various stages, players can hurl an egg at clouds with clocks on them. While some instances they will cause blue coins to appear, which must all be collected for a Smiley Flower to appear, other times they will flip the screen and give the players the chance to see what lurks in the foreground. Those segments may be temporary, but once you have progressed far enough into the game to start hunting for Poochy Pups, players can then start replaying levels they have already beaten, thanks to experiencing them in the Flip side. During these levels, players will start at the “end” of the level and must make their way back to the beginning, whilst trying to collect three Poochy Pups. Provided it’s your first time, you can get a Smiley Flower for each Poochy Pup you recover (coloured blue, black and pink,) with a fourth one available, provided you round up all three of them and get to the finish line, within the given time limit. As you progress through the levels in a backwards manner, players are presented with a different perspective afforded to them via the Front side. Not only can you see another side of various structures, but you also get to view previously unseen sights and objects. The only major downside with regards to how the Flip side is portrayed, is in the fact that the Yoshi game we have now is different to what was shown at E3. This is due to the fact that the Flip side is now separate from the Front side and performing a ground pound will no longer flip the screen, like the game’s reveal trailer shows. Another thing gone is the scene with Yoshi and the Gator train. There is a level where the train can be encountered, but it plays out in a different manner and Yoshi does not end up running round in a circle. Furthermore, even some of the level layouts are different to those that made it into the game. Naturally, this kind of thing does happen with video games all the time and in Yoshi’s case, explains why we had to go from waiting for 2018 for it to waiting for 2019, as the game has seemingly been thoroughly reworked. Just because it’s not identical to what we first saw though, that is no reason to hate the version of the game we did get. With regards to story, the events of Yoshi’s Crafted World revolve around a Dream Gem set stone capable of granting wishes and a plot devised by Baby Bowser and Kamek to steal it. During a struggle between the two villains and the assortment of different coloured Yoshi that are all playable, the Dream Gems and Yoshis, are sent flying across the game’s world. Personally, I’m a little gutted that Black Yoshi and White Yoshi didn’t make the cut, as they’re my favourite coloured Yoshis to use, but I wasn’t going to let a hang up such as that put me off on embarking on a new adventure. Better yet, should you chose a Yoshi, only to then regret your decision, you can change your selected Yoshi at any time via the pause menu when on the World Map. As for the actual gameplay, Yoshi’s Crafted World is your typical Yoshi title that brings back a number of game mechanics that Yoshi’s Woolly World did away with. (Red Coins are back, regular coins are back and so are Yoshi’s eggs.) All the player or players, need to do is get from one side of the level to the other, but how you make the journey is up to you. In addition to checkpoints dotted here and there, but amongst the plethora of enemies that Yoshi can lap up with his tongue to turn into eggs, fire at Winged Clouds and stomp on, there are also 20 Red Coins available on each level and a number of hidden Smiley Flowers. While attempting to get everything in one go is a commendable desire, provided you find enough Smiley Flowers to advance through the game and use them to unlock new areas, playing the same level over and over is not in your best interests. Still, how does the game perform when playing co-op with a friend? Well, it can be a little hectic. Although a second player can drop in and drop out at any time, you will need to work together as you play. If one tries to progress too much, the player behind will be turned into a Flying Yoshi egg that can be popped when it reaches the player in the lead. One great benefit however with dual Yoshis gameplay, is that players can use the other as a platform to Flutter Jump off of. You can also ride around on the other player. Sure the Yoshi being ridden can’t fire eggs any more, but the Yoshi on top sure can, so in the event you’re a parent playing with a child, there’s no reason why you can’t do the leg work and have them take care of enemies. In terms of game difficulty, for those of you who wish to brace the game and its bosses, on your own, it might delight you to learn that Yoshi’s Crafted World does get more difficult the further you go, with a handful of very challenging levels awaiting you in the post-game content. There are also Boss Challenges that can be unlocked after the game has been beaten and for those who do find themselves struggling on Classic Mode, Mellow Mode is available. Not only can this simpler mode be enabled at any time, but like in previous Yoshi titles, it sees Yoshi equipped with wings and makes hunting down stray Red Coins and Smiley Flowers a lot easier. Now, granted the main campaign with the post-game content consists of 49 Front side levels and 40 Flip side levels that can be beaten easily between 8 and 11 hours, I am happy to declare that you can spend more than twice that trying to get everything and I mean everything. I might not have fully completed the game yet, but after 20+ hours of playing, I have seen all 8 movie clips, heard all of the game’s 20 songs, collected 602 of the game’s 693 Smiley Flowers and bought every non-amiibo related costumes. Speaking of costumes, it’s time we tackled them next. Upon starting a new game, not counting the costumes obtained via amiibo, there are 173 of them to obtain and the majority can be purchased. With the coins players collect along their journey, they can use them on capsule machines dotted all over, to purchase each outfit. The price varies on where you are and the drops are random, but each capsule machine has 10 available outfits and if you only have enough to buy 6 from one, the next time you go to buy from it, there will only be 4 capsule balls in the machine, so you don’t need to worry about getting the same costume twice. Incidentally, you can even get a free turn on the capsules. With regards to the purpose of the costumes, in addition to letting Yoshi dress up as a Monty Mole, a milk bottle or even grass, they also act as armour. Depending on the rarity of the costume (Normal, Rare and Super Rare,) the more protection the outfit can give you. Normal costumes can only sustain three hits, whereas Super Rare can take five hits. Should you get hit a couple of times and make it to a checkpoint, your armour will be restored, but it can be broken and when the level is over, although you don’t lose the outfit, you will have to equip it again, which can get annoying. As for the costumes that can only be acquired via amiibo, only select Mario and Yarn Yoshi amiibo have costume representation in the game, but they can sustain five hits. Sadly though, despite their variety, they are now a patch on the varied amiibo outfits Yoshi could wear in Yoshi’s Woolly World. Still, what of the game’s creativity? Well, to answer that, the first area is quaint, but bland. Don’t get me wrong, the levels are easy on the eye, but compared to the levels that come after, they can be rather bland. So, if you go into the game and hate the first couple of levels, don’t go judging this book by its cover, Yoshi’s Crafted World gets better the more you play it. By no means can they go toe to toe with the kingdoms present in Super Mario Odyssey, but Yoshi’s Crafted World is a game that just radiates beauty and features one of my favourite boss battles of all time! It’s just a shame that the music, whilst endearing and pleasant, is lacking when compared to the delightful tracks of Woolly World. That negative aside though, while Yoshi’s Crafted World isn’t Yoshi’s answer to Odyssey, it can definitely hold its own against the likes of Kirby Star Allies and delivers a couple of jabs that even Donkey Kong Country: Tropical Freeze won’t see coming. It is fun, it’s colourful and what Good-Feel have been able to pull off, is still impressive nonetheless. It’s not the greatest Yoshi game of all time, but it’s far from being the worst one. If you were worried that Yoshi’s Crafted World would be this year’s answer to Kirby Star Allies, you were right to harbour such ill feelings. The main campaign is on the short side, there is a lot of repetition and the game can feel spammy at times, but it isn’t a complete right-off. So, as long as you love Yoshi games in general and can’t get enough of platformers, Yoshi’s Crafted World is an imaginative title that is hard not to enjoy. It does feel a little pricey for what it does offer, but after 24 hours of playing it, there’s still plenty more to be done to 100% complete every aspect of the game. To conclude, regardless of Yoshi’s Crafted World not being the Yoshi game fans had hoped it would be, it’s the one we got and it is a game well worth sinking time into!